Preheat the oven to 425 degrees. Coat a baking sheet with cooking spray. Combine the olive oil with the maple syrup and spices; whisk until well combined. 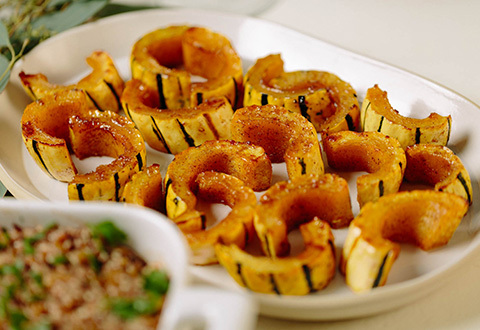 Place the squash slices into a bowl and add maple syrup mixture; toss to coat evenly. Place onto the baking sheet then sprinkle with sea salt. Bake for 7 minutes, then flip the squash over. Continue to bake for about 10 minutes, then flip the squash over again. Continue baking for a few more minutes, until the squash is fork tender. Remove from the oven and let them cool a bit before transferring to a serving tray.